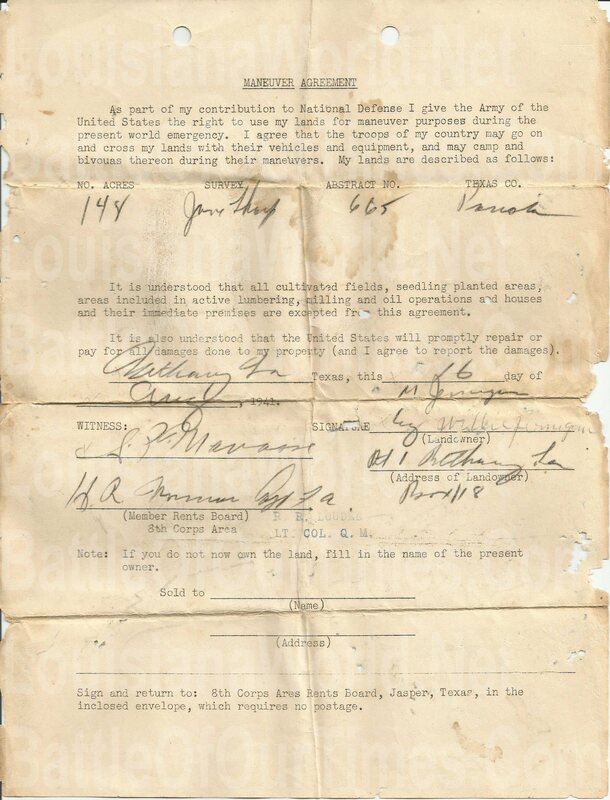 Document: #Louisiana Maneuvers Agreement 1941 | BattleOfOurTimes.Com ⚜ T.E.C.W. My father was going through some personal things and stumbled across this document. He isn’t sure how it wound up in his possession, and after asking many family members it remains a mystery. The document doesn’t seem related to property owned by our family. He is considering donating the document to a museum. We have a Louisiana Maneuvers Museum here locally and that could be a great possibility. He would like more information before making a decision. The property owner on this document was in Bethany, Louisiana/Texas Caddo Parish/Panola County near the state line. Anyway, it’s a fascinating find. This entry was posted in #LWN and tagged BattleOfOurTimes.Com, Bethany, Caddo Parish, CENLA, Louisiana, Louisiana Maneuvers, Louisiana Maneuvers & Military Museum, LouisianaWorld.Net, Panola County, Pineville, Texas, United States. Bookmark the permalink.